I'm SO excited to share this post with all of you. Last weekend I attended Renegade and was blown away by one booth in particular and wanted to share my break down of the elements that made it stand out from the rest. 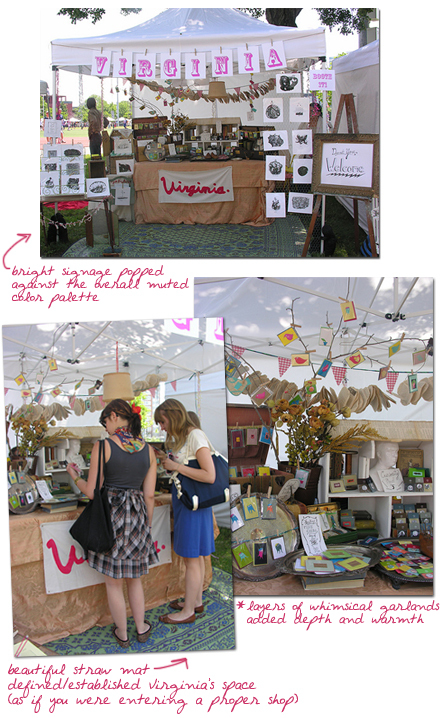 I had so much fun putting this together - Virginia is just plain inspiring and working on this post allowed me to revisit her amazing booth, which was by far the best booth at Renegade. So of course, I had to ask her to stop by to school us on how to rock a craft fair with an awesome booth design. 1. My overall concept somehow formed itself. I began collecting objects in March with the intention of being accepted to Renegade (I had never applied to any fair before, but was so confident in myself that I would be a part of this year’s fair (since I wanted it so much) that I began preparing for it, and if not Renegade, then for something else. Besides, I love sourcing odd and vintage objects for my home and my studio for inspiration and vibe, so it was a win-win checking out various thrift stores, consignment shops, and used furniture warehouses in and around New York and Connecticut (and of course, raiding my mother's garage!). 2. With everything I create, the inspiration comes from an internal place that holds everything dear to me, each beautiful experience, places I’ve visited, people I adore, nature, the notion and style of the 60s and movies like Charade, my idol Jessica Fletcher as played by Angela Lansbury in Murder, She Wrote), Paris (a city I had the pleasure of living and studying in for a year after high school), and I am physically drawn to certain objects and themes in my life that just seem to follow me around wherever I go. My theme for this particular display was a ladies' vanity table combined with the sets of the film The Royal Tenenbaums, and I worked around that. 3. My process begins with lots of lists, a little sketchbook I always carry around in my pocketbook, and starting a new Numbers file on my Mac. I constantly jot down ideas and draw little pictures over and over again so I don’t forget them, and any images that catch my eye, I collect in a digital collage on my computer. What saved me for planning out this display for Renegade was setting up everything in my living room for a month (which my boyfriend really enjoyed, ha), and tweaking it every few days until I had it right. Plus, I spent days researching online craft fair do’s and dont's beforehand, as well. 4. Setting up for the fair took three hours the first day, and two hours the second day. There is no way I would have been able to have such a swift set-up or break-down without the help of my lovely family and friends! Certain aspects of my display were left to the day of since my tent did not fit opened up in my living room (yes, I actually thought it would open up all the way, so I tried to fit a 10’x10’ canopy in my apartment... to no avail). 5. The night before Renegade I told myself to just let it all go. I did the best I could do, I spent months working on my display and product, and there was no more time to prepare or be even more organized than I already was. Once you let any worries go and embrace whatever comes your way, I think you allow what you truly want to find its way to you. In other words, the only thing I couldn’t prepare beforehand was figuring out the best way to display my drawings around the tent, and even though we (my brother and I) came up with a solution, it still bugged me the whole time that it could have been better. We ended up pinning some of my prints with clothespins to a wire rack, and the rest to some chicken wire I was compelled to buy weeks before. Clothespins leave indentations on my work, and dust collects on the plastic sleeves making each display item pretty much unusable and unsalable again, but I really cannot complain otherwise. I was and still am pleased as punch with how everything turned out and was amazed and enchanted with all the wonderful people I was able to chat with and say hello to at Renegade. Everything is beyond "worth it" just to have someone compliment you on something you made with love. Don't forget to check out a brand new Retail Therapy below with Brooklyn toy shop Acorn. Awesome set up! I am doing one show this summer and am going to do a trial set up before the event (probably several trials!). Your booth is inspiring! Great job! Her setup is GREAT! I love creative booth setup's. Awesome booth! It's like a boutique =) I like the use use of old luggage, a tape measure, twigs & a silver platter to display the merchandise! amazing! thanks for posting that, it's super duper inspiring and what a lovely booth. Great job! And for her 1st show - awesome! Love the tree branch with the cards pinned to it! Wow! Excellent, thanks for sharing all this, it is really helpful and the booth was adorable, love her style!! what an absolutely happy booth! oh my gosh!! awesome, awesome, awesome job! WOW! This is awesome and very inspiring! Inspirational and well thought out - thank you for sharing your booth story! Gorgeous set up for her booth. Def would draw lots of people in! Wow, what a booth! I am always inspired/intimidated by such creativity! So great! I LOVE looking at other people's booths. This is truly awesome. Thanks so much for this post. I just did my first show -- a small local one, and was hemming and hawing about applying for Chicago Renegade -- this totally inspires me to just do it!! Love LOVE Virginia's STYLE! I hope I'll be brave enough next year. I absolutely love these kidns of posts, so thank you so much for this. And what an awesomely amazing job virginia did! I love the dedication and planning. great idea. thanks for share. I love those picture. See you on my blog also. so fabulous! what a great eye for details and colors! The thought, the love and the time she puts into her work are wonderful and an inspiration to all of us craft goers. Beautiful. so useful! thanks for posting this marichelle! yay. This is fantastic! So much great information here. I'll be linking. Wonderful set up. It's inviting and creative. WOW! Her booth looks amazing!